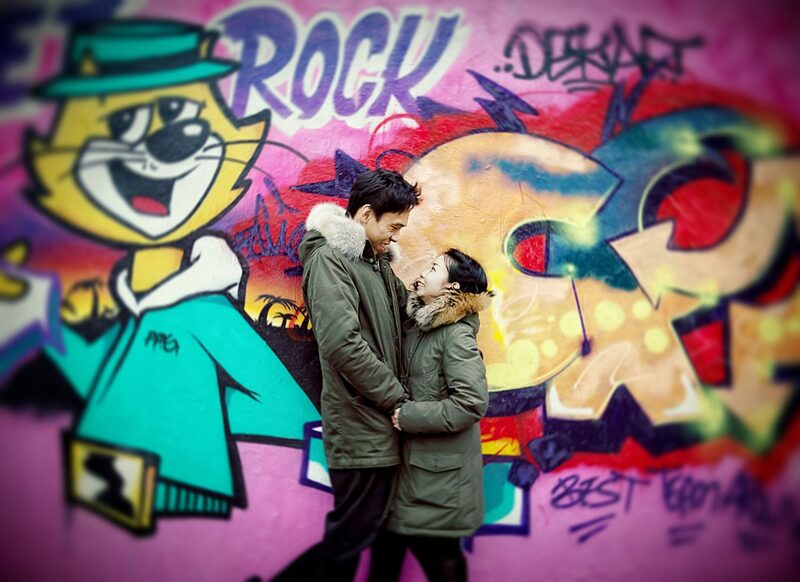 It is no secret to those that know us that Joanna and I love Muswell Hill. After all this is where we first met, and where we lived in the imposing shadow of Alexandra Palace. 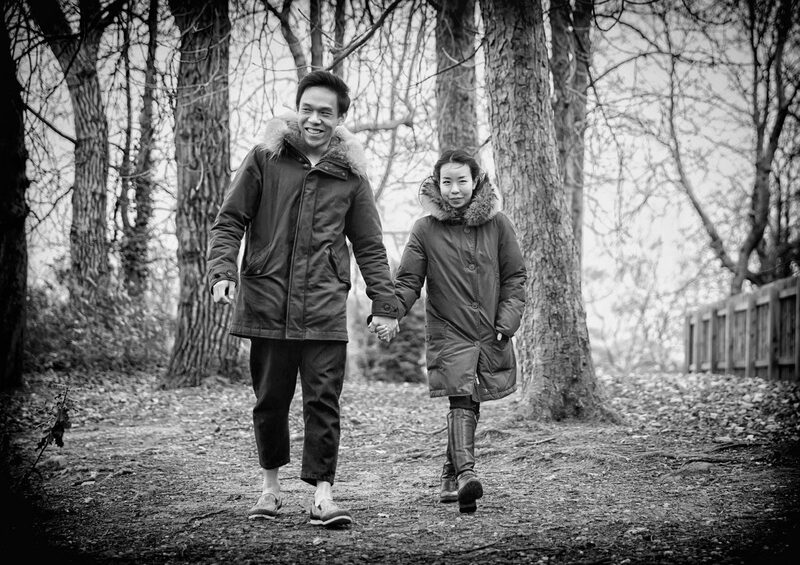 Yickyin and Leo in planning their future wedding found us when searching for a London wedding photographer for their Christmas wedding at The Goring Hotel in Belgravia. 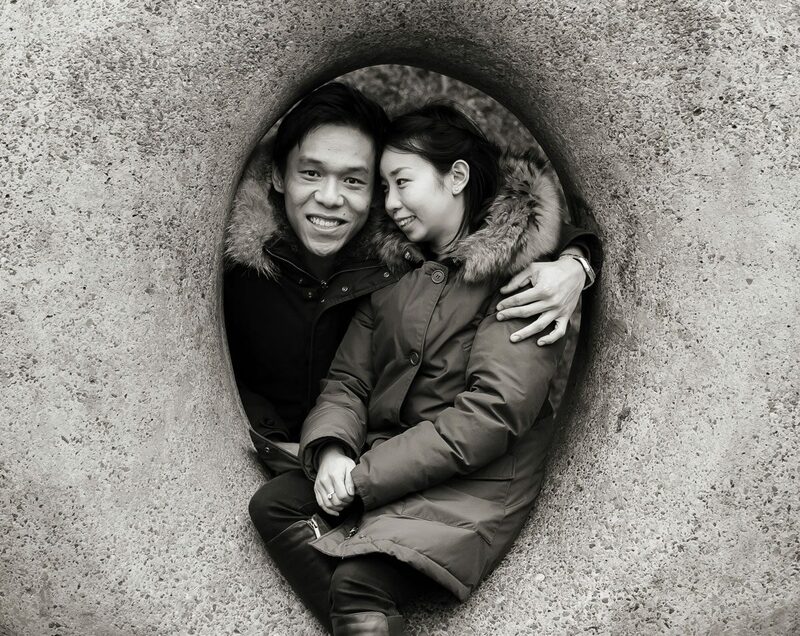 They are a couple from Hong Kong and wanted to relax themselves in front of the camera and create some imagery they could use for their invitation cards and general wedding stationery. One or two of the many bonuses of a pre wedding shoot. 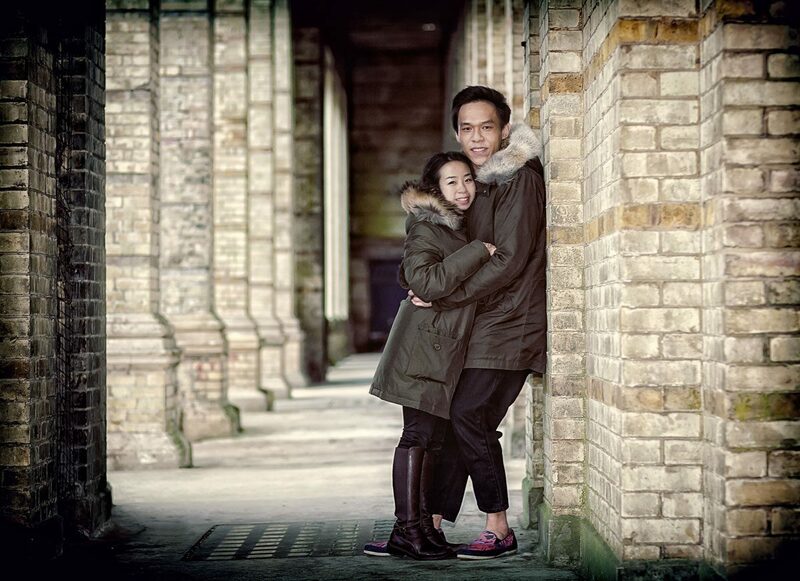 As they also lived in the north of the capital I suggested an engagement shoot at London’s Alexandra Palace in Muswell Hill. We love the mixture of urban and classic architecture mixed with natural greenery and trees and a lovely little boating lake. 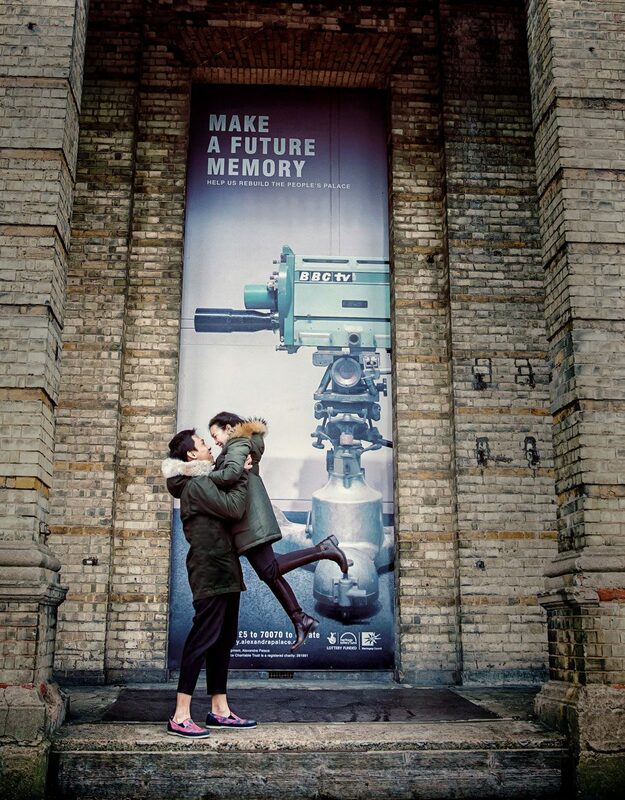 All places that we had taken the children to many times, and as far as a venue goes for engagement photography I don’t think you could ask for much more. You have to know what you are doing though obviously, pictures and emotion don’t creates themselves out of nothing! Another thing we had to bear in mind was the timing of the shoot too as Alexandra Palace can become very busy very quickly. 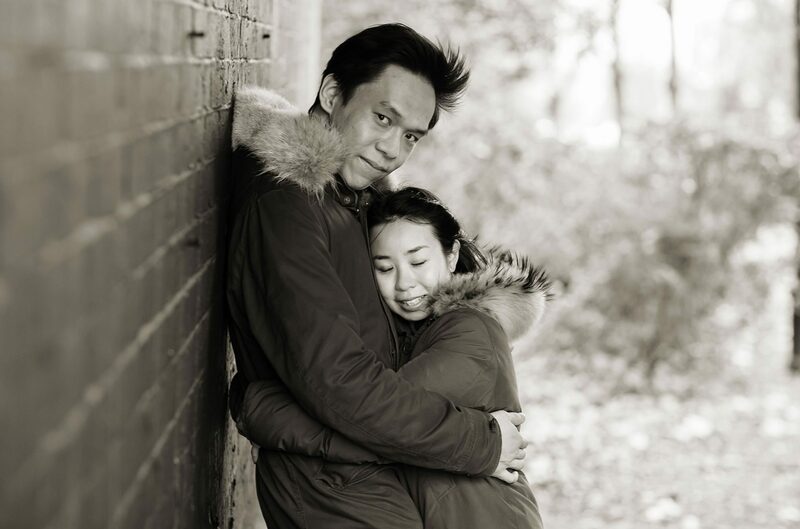 Shooting wedding days in the centre of London that is the norm, so we are very adept at dealing with crowds and crowded places, but it is nice when doing some pre wedding photography to have a little more privacy. 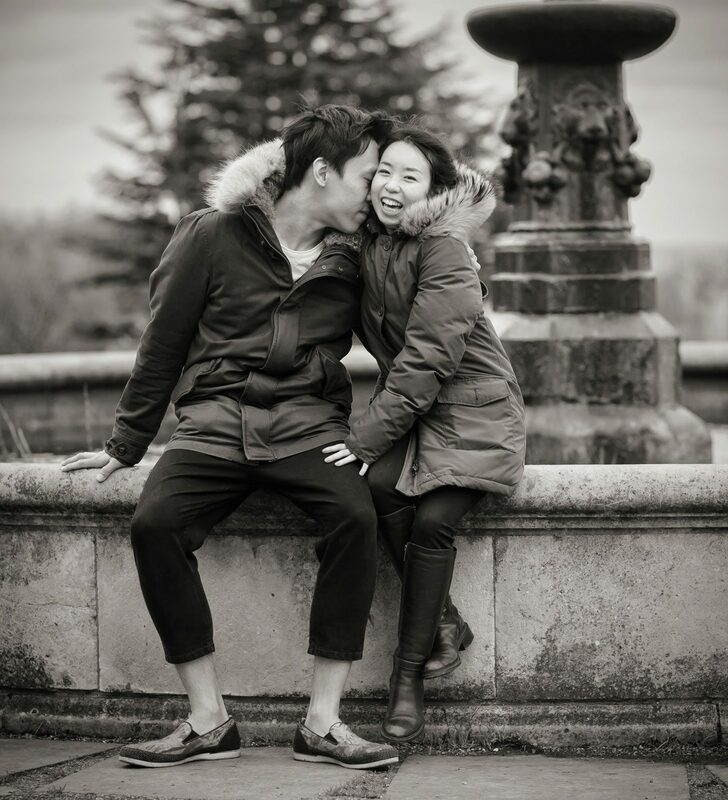 This Chinese engagement shoot (that’s how I saw it) was on a Saturday afternoon, however it was so windy, almost gale force, and overcast that crowds were not a problem! In fact only twenty four hours before I had been at Alexandra Palace with the lovely Ashley and Paul who are getting married in London too at the Hampton Court Hotel next to surprise surprise Hampton Court Palace. Their day was typified by strong sunshine which dictated where I could place them, but also added a bonus effect of depth and texture that I could create in the imagery. For Yickyin and Leo we had a dull sky and extreme wind to deal with, but we made this part of the fun and also went for a little more quirkiness to compensate. 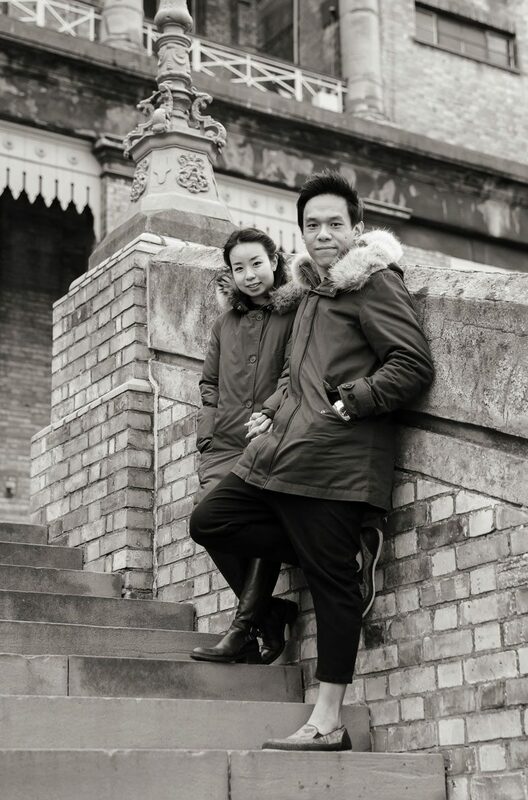 One thing I have noticed with Chinese couples is that they are very open minded to slightly off the wall ideas, especially if they are from Hong Kong, must be something in the air there! I used quite a bit of creative flash as well to give their photos a little lift in dull conditions. Alexandra Palace itself has a very interesting history. It was built in 1873, but according to some accounts a roof worker’s unextinguished cigarette started a fire that destroyed the entire structure. Good old Victorian builders didn’t hang around though, and by 1875 they had rebuilt it to a slightly different design. Nicknamed affectionately “Ally Pally” it is probably most famous for the fact that the British Broadcasting Corporation know to us all here in Great Britain as the BBC, started the world’s first regular high definition television broadcasts in 1936. I wanted to incorporate a little of this history into the engagement photos as you can see from some of the selection here. Also notice we got lucky for the featured image of these Chinese love birds, as two local winged creatures flew by at just the right time, although I was waiting for something like this to occur anyway as I kept clapping my hands to try and make it happen!